When you are trying to make big changes in your life and you are trying to get healthier so you can lose weight, be stronger and live longer, you need to look at your life to see what habits you need to remove from it. Many people carry about a passel of bad habits with them, and quite a few of them are going to make it much more difficult to live a truly healthy lifestyle. Here are a few of the habits that you need to break if you want to reach your fitness goals and be a healthy person. It is hard to quit smoking. Many people try and then fail, and others do not even bother until it is too late. Aside from the horrors of cancer, heart disease and other afflictions that the habit can cause, smoking is going to inhibit your ability to reach your fitness goals. When you smoke, you are taking in particulates into your lungs, and this causes you lungs to have more difficulty bringing oxygen into your body. You will find that when you exercise, you are more winded than others who seem to be in the same general health. You will not be able to run as far or as fast either. This is going to put a damper on your weight loss goals. You need to quit smoking as soon as possible. With all of the health risks involved, your life depends on it. When you drink alcohol, you are bringing useless calories into your body. Even if you eat healthy food most of the time, the calories that you take in when you drink aren't doing much. Those who drink excessively will likely find that they have diminished energy levels. They will not want to get out and exercise and that means that those extra calories are going to become fat. 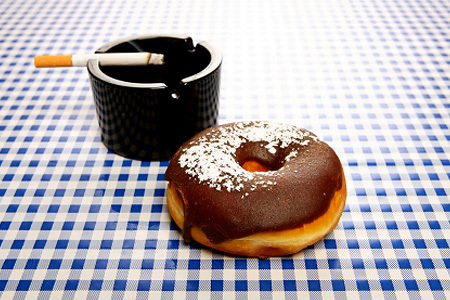 Another habit that you have to wipe out if you are going to get healthy is bad food. Unhealthy fast food and junk food is going to keep you from reaching any of your goals when it comes to fitness. You can replace the bad habits with ones that are healthy. Instead of smoking, drinking and eating junk food, you can start to get more exercise. You can replace the food that you have in your refrigerator now with some healthy alternatives. When you feel like you want to smoke, go outside and go for a jog to see how good your lungs feel without the smoke in them. When friends or family are at a bar or a club, offer to be the designated driver so you do not have to feel as though you need to drink to fit in with the revelers. Once you start removing those bad habits one at a time, you will see that it is possible to overcome them. You can get healthy and achieve your fitness goals. Just make sure you lose the nasty habits first!